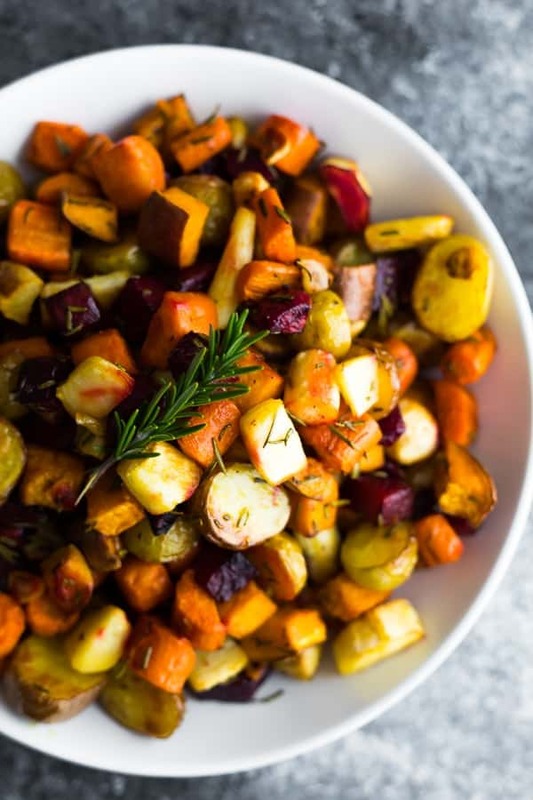 Rosemary roasted root vegetables is a beautiful, hands-off side dish that is perfect for a weeknight dinner, or for your Christmas, Easter or Thanksgiving table. 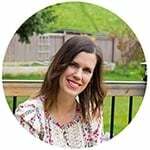 Vegan, gluten-free and paleo! Does anyone else get more excited about the holiday side dishes than the main entree? 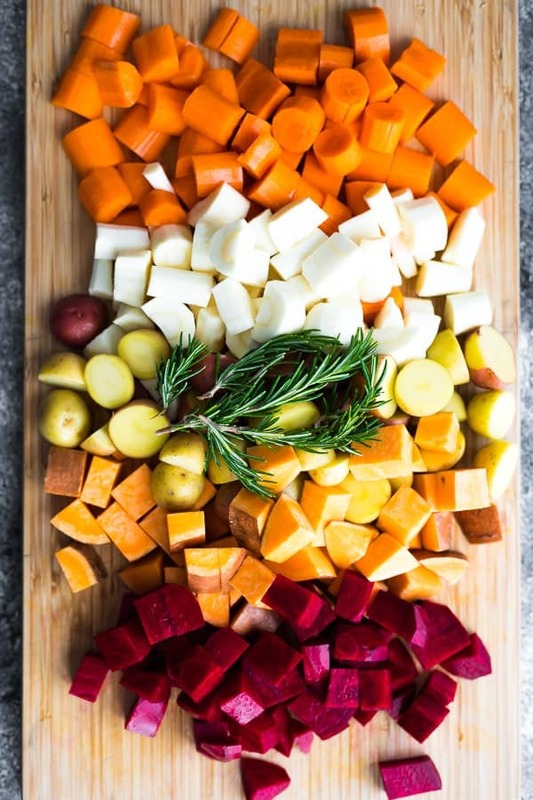 Recipes like this rosemary roasted root vegetables are the reason I do! With roasted carrots, parsnips, beets, potatoes and sweet potatoes, it’s pure delicious comfort food…and it’s healthy, too! they are reeeeeally simple to prep! Are you ready for how simple this is? 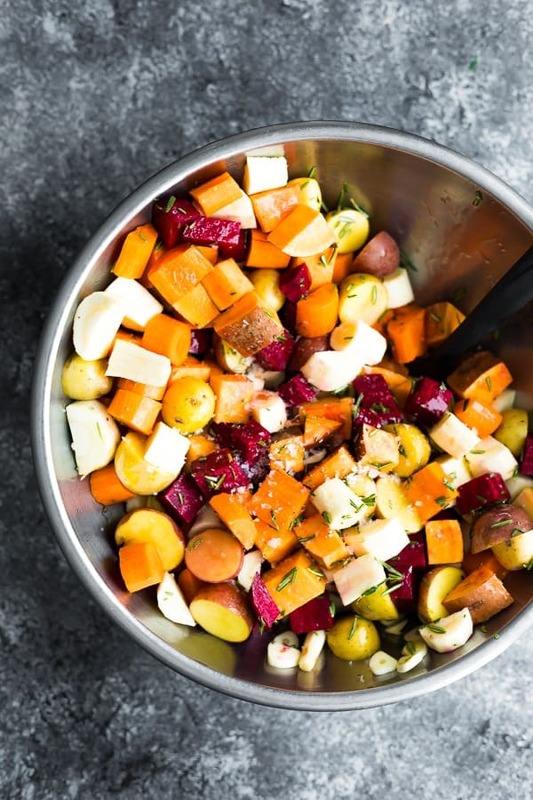 The bulk of the work involved with this roasted root vegetables recipe is going to be in chopping your veggies, and even that is not too bad! Toss in olive oil with rosemary, flaky sea salt and sliced garlic. Spread out on a sheet pan. Roast away! I gave my roasted root vegetables recipe a stir up halfway through. 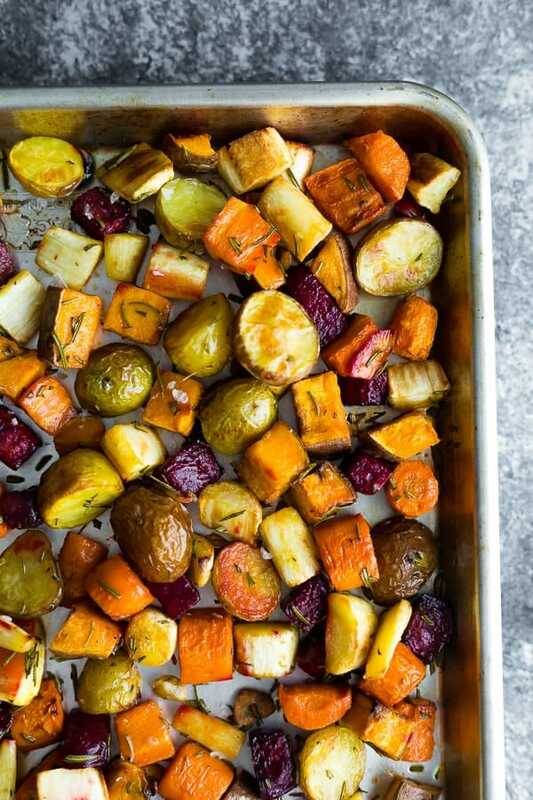 Can this oven roasted vegetables recipe be made the day before? This recipe is definitely best served fresh, however you can roast them the day before, then rewarm in a covered pan at 350°F for 20-30 minutes, or until warmed through. 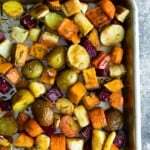 Can I swap out the rosemary in this oven roasted root vegetables recipe? Sure! I bet one of these seven spice rubs would go great on these roasted veggies. Add 1-2 tablespoons. Can I swap out one of the root vegetables? Sure, you can leave out any of these vegetables. When swapping, make sure you pick a vegetable with a long roasting time. Butternut squash might be a good pick! What goes well with rosemary roasted vegetables? don’t overcrowd the pan…if you do, you can cook for 10 minutes longer or until everything gets nice and golden. 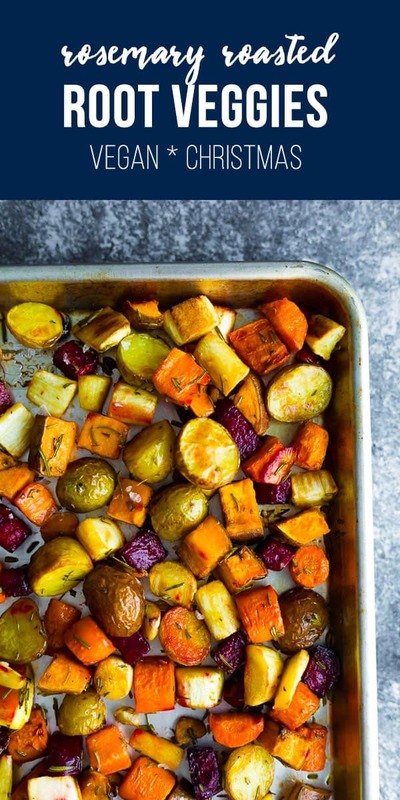 Looking for more oven roasted vegetable recipes? Try this Cinnamon Roasted Butternut Squash, this Parmesan Roasted Cauliflower or these Make Ahead Honey Roasted Carrots! 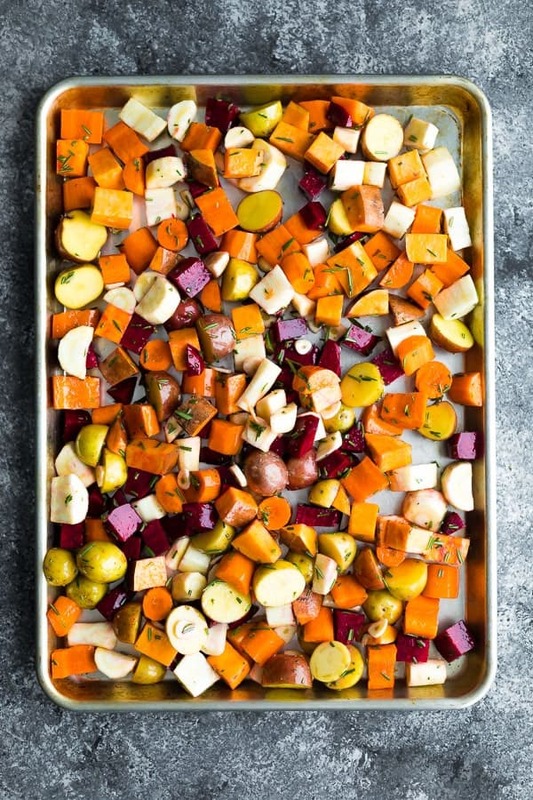 Toss vegetables with olive oil, flaky sea salt, rosemary and garlic, then arrange on 1-2 large sheet pans. Bake for 30 minutes, give everything a good stir and return to the oven for another 15-25 minutes, or until cooked through.